It’s quick, easy and effective, resulting in a great conditioning hair rinse. I experimented making my own bath and beauty products as a teenager and never seemed to tired of it. 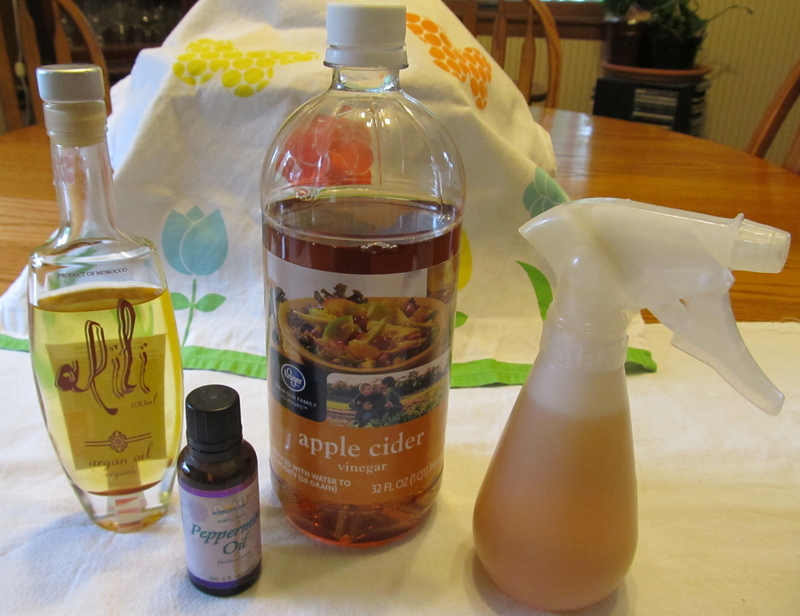 Recently I started using cider vinegar as a hair rinse and love the simplicity. It makes my hair soft, manageable and full of body. That is high praise coming from a woman with fine hair! I recently needed to improve the condition of my hair because during the summer I spend so much time outside under the sun, and I found just the right product to protect and nourish my hair. My daughter gave me a bottle of Argan Oil as a gift and beauty aid. I used it as a facial conditioner and thought it had possibilities for my hair. Argan Oil comes from the Middle East and is made from a tree nut. Women cooperatives are known for working together to manufacture and market this product, and I love to support initiatives which positively affect women around the world. The ingredients are simple and few. Cider Vinegar, Peppermint Oil, Argan Oil, and water. You will need to purchase a spray bottle. Fill the container 2/3 to 3/4 full of cider vinegar. Add a few drops of peppermint oil and 1/4-1/2 tsp argan oil. Fill the bottle with water. I use tap water because I have a well, but suggest distilled water for those on city water. I encourage that you experiment with the oil amounts that work best for you. Given my fine hair I cannot use large amounts of oils; you may need to increase the amounts suggested. Simply shake the bottle to mix the oils and spray on hair after washing and rinsing. Rub through the hair evenly and rinse with warm water. My spray bottle sits in the shower at the ready. That’s it! What could be easier? I hope you give this recipe a try while enjoying the simple pleasure of making and using your own conditioning hair rinse. I would love to hear back how it works for you! This entry was posted in activities, bath and body products, creativity, DIY, gift ideas, Life's Simple Pleasures, Recipe, Uncategorized and tagged argan oil, bath and beauty products, bath and body, cider vinegar, diy, hair conditioning rinse, hair rinse, peppermint oil, simple pleasure, support women initiatives, vegetarian, water. Bookmark the permalink.